Last Saturday THE GARAGE hosted a benefit by nonprofits To the Bridge Foundation and the Minnesota Music Coalition to raise awareness about substance abuse with a bill of top local bands, the headline being a collab set between hip-hop powerhouses Astronautalis and Sims. On an emotionally heavy night supporting an important cause, the musicians kept the audience focused and entertained, sharing stories and pledging support between top notch performances. The first band, Hope Country, was a mellow folk band who started the night off with a fantastic acoustic set. If you’re looking for a soothing nighttime band I highly recommend this one. Hope Country has very strong rhythms and melodies, which I think was the perfect opening to the show. Molly’s Worst Enemy were the second band of the night who played a pop punk set. They had a very fun set list and encouraged the crowd to keep moving throughout their songs and to join in singing if they knew the words. Whether you enjoy pop punk bands or not, this band is very easy to listen to and enjoy. The Still Sound was the next band, another folk acoustic group like the first band, although they had their own unique take on this genre of music. They were similar in the ways of being calming, mellow, and a great group to listen to when you’re trying to unwind after a long day, but they sounded pretty different at the same time. They had one sentimental song about a hardship the singer went through in losing someone close to him. For it a female friend come up on stage and help him sing it. That song I thought showed a lot about who the group is as a whole. The final performance of the night, the one that everyone was most excited about, was Sims and Astronautalis. 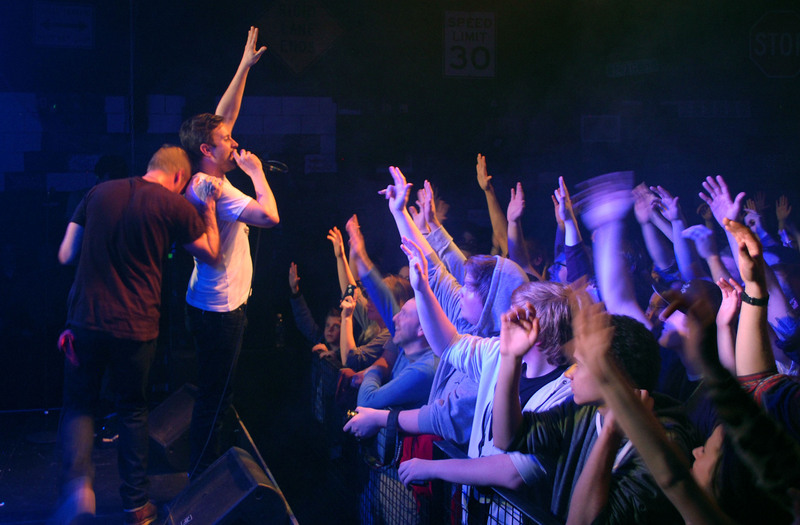 By the time they came out on stage, the whole venue was packed and half the audience was wearing the logo from Doomtree’s No Kings. Back in December I went to the Doomtree all ages blowout, so after seeing that I think it was extremely cool to see how Sims performed without Doomtree, instead teamed up with Astronautalis. If you’ve never listened to hip hop, I highly recommend you forget all you think you know about that genre and check these two individual artists out, because they will blow your mind. Throughout their set, they performed songs they collaborated on as well as their own individual pieces. Part of what made their performance so much fun is that in-between songs Astronautalis, Sims, and their DJ–DJ Fundo–were very entertaining. They told stories and cracked jokes to make the whole crowd feel welcome. Astronautalis shared with all of us how exactly a year ago from Saturday his house burnt down, after which Sims took him in as a roommate. He joked by telling us he’ll sometimes say he’s the king of something and Sims’ reply is always “No Kings! !” as a reference to the Doomtree album. Personally, hip hop shows are my favorite type of show to go to because no matter if you know the songs or not, the crowd’s so easygoing and is always such a fun environment. The show Saturday was a very fun night full of enjoyable music and very energetic crowd. If you haven’t already checked out any of these bands, I highly recommend doing so–you won’t be disappointed.